Our women's Classic Pons Avarcas in Metallic Pewter offer a cooler-hued tone to add a bit of shine and style to your look. 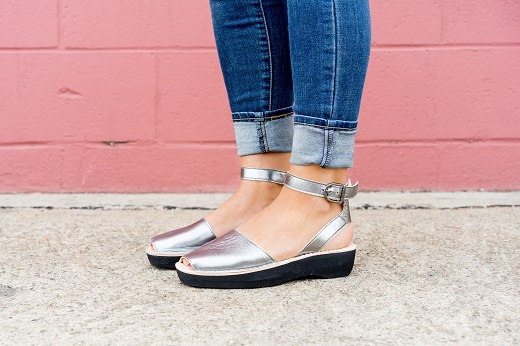 Whether it’s jeans and t-shirt or a nice dress, this Pewter sandal is a neutral we recommend adding to your closet. Handmade in Menorca, Spain from high quality metallic leather, these Pons have an ankle strap with a buckle closure for a secure fit, ensuring you feel at ease and comfortable wearing these sandals. For a touch of additional style, these Pons feature a 1.5 in (3.80 cm) lightweight platform sole.